The UNESCO-listed historic center of Florence, birthplace of the Renaissance and home to some of the most iconic artistic and architectural masterpieces in the world, is a must-see when visiting Italy. Here's how to explore the city's main highlights and discover a few little-known gems with two full days in the Tuscan capital. Morning: Begin by getting to know Florence's most famous landmark from top to bottom: the Florence Duomo. Tackle this popular sight first thing to beat the crowds, and book a tour with skip-the-line access to avoid spending the bulk of your morning waiting to enter the church, baptistery, bell tower, dome, and museum. Afternoon: Following Florence's famous architecture, it's time to move on to its impressive art. Join a combo tour that visits both the Uffizi and Accademia galleries to touch on the highlights of both these museums without feeling overwhelmed. Skip-the-line tours are a must for these attractions, which draw millions of visitors each year. Night: You've had an intense day of culture, so now unwind while sampling some of the excellent wines produced in the Chianti hills outside of Florence—perhaps paired with some of the region's cheeses, meats, and olive oils—during a food or wine-tasting tour. Morning: Now that you've crossed the Duomo, Uffizi, and Accademia off your list, explore the sights of Florence's city center from the Ponte Vecchio and Piazza della Signoria to the quiet lanes of the Oltrarno. Hop-on hop-off bus tours are a perfect way to get an overview of the city, while guided walking, biking, and Segway tours offer up-close experiences. Afternoon: Dive deep into Florence's traditional cuisine by learning how to prepare some of its most famous dishes during a cooking class. Discover the secret to making pasta, pizza, and other specialties, and then enjoy the fruits of your labor during an informal meal at the end of the class. Night: You will soon say goodbye to Florence, so make your final evening special by watching the sun set over the city. 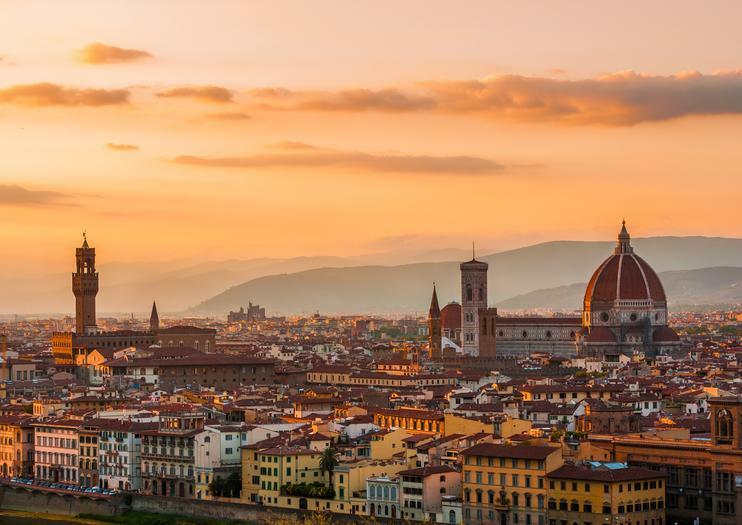 Book an Arno river cruise or head to the Piazzale Michelangelo on foot, bike, or hop-on hop-off bus tour to watch the sun set over the water. Spend a morning in Florence visiting two of the world’s most important museums on a great-value combo tour of the Ufizzi and Accademia galleries. See iconic Renaissance masterpieces from Italy and beyond, including the works of Leonardo da Vinci, Raphael, Botticelli and Michelangelo. Learn about collection highlights from an art historian guide, and enjoy leisure time to explore the museums on your own. In between stops, recharge with a typical Italian cappuccino breakfast. Explore the heart of the Renaissance by Segway on this 3-hour tour of Florence. Led by a local guide, you’ll pass top attractions such as the Uffizi Gallery, the Duomo and Piazza Santa Croce. Cover more ground than a walking tour as you hear the history behind this famous city from your guide. Headphones will also be provided so that you can hear the commentary more clearly as you glide through the streets. After three hours of exploration, your tour will conclude at its original departure point. Get a taste of aperitivo, Italy’s popular happy hour tradition, on a 2.5-hour tour in Florence. Begin the evening at a typical Florentine-style wine bar to indulge in Tuscan cheeses and salami while sipping some regional vino. Then, head out to explore some of Florence's most charming neighborhoods, before stopping off at a cocktail bar for a true Italian aperitif. Numbers are limited to 12 people to ensure an intimate experience. Saddle up for a 2.5-hour bike tour through the streets of Florence. Led by a local guide, pass top attractions such as the Uffizi Gallery, Piazza della Signoria and the iconic Ponte Vecchio. As you travel around the historic sites, learn interesting facts and anecdotes about this Renaissance city from your guide. Pull over to enjoy a complimentary coffee or gelato before finishing up your Florence biking excursion. Glide under the iconic Ponte Vecchio bridge and across the Arno River on a 1-hour Florence river cruise. Hop aboard your barchetto, a small traditional boat that is one of only four still operating in the city. As you see the sights like the famous Uffizi Gallery from the water, toast your fellow mates with a glass of Prosecco. Dig into the history of the Tuscan capital in a way the whole family will enjoy with this 2.5-hour walking tour of Florence for families. Join a kid-friendly guide as you explore Santa Croce, the San Lorenzo Market, the Porcellino, Piazza della Signoria, the Duomo, Piazza della Repubblica, Ponte Vecchio, and more. Keep kids engaged with interactive games and activities. Treat your taste buds while in Florence on this 1-hour cheese and wine tasting. Accompanied by an expert sommelier guide, enjoy the setting of a traditional Italian wine bar as you’re introduced to platters of fresh Tuscan specialties, complemented by four regional wines. Learn about the flavor notes and characteristics of each wine as you sample olive oils, cheeses and more. Numbers are limited to 12 on this small group tour to keep the experience as intimate as possible. Experience the magic of a Tuscan sunset in Florence with a traditional Italian aperitivo on this 2-hour evening tour. Soak up the atmosphere of the Renaissance capital after dark as you follow your guide on a walking tour around the historic center and the districts of Oltrarno and San Frediano. Admire illuminated landmarks like the Ponte Vecchio, Santo Spirito church and the Duomo as you explore the city, and stop along the way to sip Chianti wine and nibble on delicious Tuscan ‘crostini’. Explore the Renaissance city of Florence on a full-day tour with a private guide. See top attractions such as Michelangelo’s 'David' at the Accademia Gallery, Duomo, Giotto's Bell Tower, San Lorenzo Basilica, Uffizi Galleries and more. Learn the stories and rich history behind each site that you pass, soaking up the personal attention from your private guide, with a tasty lunch included.